The 2015 Christo is a Rhonestyle blend of 64% Syrah, 23% Grenache, 7% Petite Sirah, and 6% Viognier. 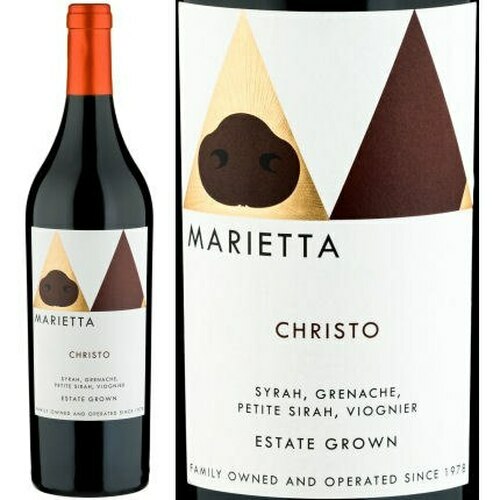 Beautiful blackberry fruit, peppery herbs, underbrush, and a hint of olive all give way to a medium to fullbodied, plump, textured beauty that shines for its charm, texture, and pleasure-bent style. This intense, powerful Syrah-based wine is grown mostly on our McDowell Valley property which has a long history of championing Rhone varietals. Co-fermented with Viognier, the Syrah expresses violet, tar, and rich earth. Petite Sirah from Alexander Valley brings chewy bitter chocolate, while Grenache grown at 1400 feet elevation in the Yorkville highlands keeps the wine bright and juicy. Full-bodied and fleshy, this wine is dark and brooding yet silky and smooth.